If you're at high school, college, or you work a job, this is something that you absolutely must know how to do? Not too long ago I wrote an article about how to confidence test other men. That article was more about how to defend yourself when other men try to test you. This article is sort of a follow up to that article but on a much more important subject. Honestly guys let's just be real here for a minute. No matter what your age, you will be tested by other men and you will also be tested by girls. Just as life never stops testing you. The same is true of people. Even the males in the animal kingdom test other males. However, even though we're a lot like animals, we tend to test more with our verbal abilities than with our physical strength. This is obviously because we live in a structured society. So if you just punch some guy because he made you mad you're the one who's going to jail not him. You've probably heard the saying that sticks and stones will break my bones but words will never hurt me. The truth is that when wielded correctly words don't need to break bones because they're capable of breaking a man's spirit. Think back to a time when another man said something really hurtful to you. At that point in time you probably wish he would have just punched you because it would have been less painful. What many guys don't realize is that it's literally hardwired into our genetic code to test other men and this type of testing for the most part is harmless. What you need to be able to defend against? Is the testing that's not harmless. A verbal fight between two men can erupt from any number of causes. Sometimes it's caused by a simple confrontation with some guy from school that you don't like. The most common way that you can accidentally bring the other man's Eagle into the battle is by directly and harshly attacking him personally with your words. Picture two drunk guys outside of a bar. The alcohol and their systems causes both men to lose logic and common sense. So when they get into a verbal battle both men start immediately calling each other a-holes and similar names. These direct attacks trigger each man's ego defenses and once this happens autopilot fight mode is engaged in the situation will quickly turn physical. The second rule of handling a verbal battle with other men is to never ever get defensive. This is a catastrophic mistake that almost every guy makes without even realizing it. Imagine you're playing call of duty or a similar game your opponent starts taking shots at you and after they start hitting you, you just stand there and start trying to reload. Meanwhile while you're standing there getting hit and trying to reload the shots just keep coming one after the other relentlessly. This perfectly describes what would happen to you in a verbal battle. Let's imagine that you're in school and some guy says man look how weak you are you can't even lift that chair. After hearing those words your automatic reaction is to get defensive and respond with an explanation as to why you can't lift the chair. This is the wrong way to handle. It's like in a boxing match when one guy gets a solid hit on the other and since I'm ruling against the ropes. After he sees that he almost knocked the guy out with that single punch, he unleashes everything he has on his opponent right away and wins the fight. Instead of getting defensive and trying to defend yourself after the first verbal attack, the correct thing to do is immediately respond with a counter-attack against your opponent. But what do you actually say? Hhow can you effectively disable your opponent and win the verbal battle? The best way to dominate the other man consists of two things. 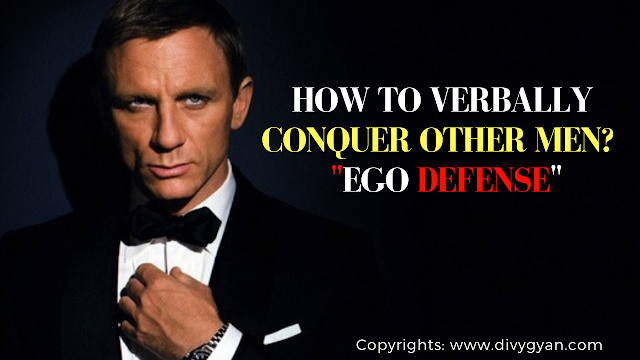 The first thing that you must do is disarm it without harming his ego. This can be accomplished by replying with something that takes a good amount of brainpower to process. For example, let's say the guy who's battling you is some guy who works out and has bigger muscles than most other guys. Your counter-attack could be something like well I guess what they say about guys with big muscles is true after all. Your counter-attack should also be conveyed using a light joke like tone. The tone that you use is just as important as what you actually say. Because it conveys confidence and it shows your opponent that A: you're not afraid of him and B: that you're far from defensive after his first attack. If you're wondering why you need to counter with something that forces your opponent to really think hard to know what you meant? It is because doing this basically disarms your opponent mentally. complex mental activity of trying to figure it out, is like you landing a solid punch in a boxing match. After your counter-attack there is still one more thing that you need to do to win the battle and it's simple you need to walk away. Think about all the times that you've been involved in a verbal battle with all their guys or even girls and how these situations ended? In most cases, it just turns into a shouting match going back and forth between each person until you both get too exhausted to continue. When this happens nobody wins and you both walk away as losers. It's like when a rapper reaches the pinnacle of his career and instead of leaving on a high note as a winner, he tries to fight back against negative momentum and ends up ruining his previous good image. Once you deploy your counter-attack against your opponent and leave him reeling against the rose, Just walk away before he has a chance to recover and leave the battle as a winner. With this knowledge you can effectively and psychologically dominate any man who starts a verbal battle with you. A famous quote once said be careful with your words because once they are said they can only be forgiven never forgotten. Tags : "ego" "how to confident test other men" "how to win any argument" "verbal" "why guys test guys"